In order for a person to display on a Meeting as a Member, their Enrollment Date must pre-date the Meeting Date. Along that same line, in order for a person to stop displaying as a Member on a Meeting, their Drop Date must pre-date the Meeting Date. This training video show the basic way to record attendance manually. Place your cursor in the Name field, and scan the long bar code (the class bar code) in the top right corner of the page. This creates the meeting and takes you to the meeting page for that organization. Once you are on the meeting page, make sure your cursor is in the Wand Target field. Scan the individual bar code beside the names of those marked present. The scanner will beep each time it registers a bar code. You will see the names of the members and recent visitors after you scan the bar code for the first person. That will enable editing. Scan the class bar code for the next class and proceed beginning with step 3 above. Attendance is posted to the database as you scan each person. There is no need to Save Changes or Update. Can scanning wands be shared between ministries - i.e. on different computers? Yes. They plug into a USB port and do not require any special software. Does the scanning wand work with colored paper? Yes. Pastel colors work great. Avoid dark colors like red or dark green. Does it matter which direction I scan? No. You can scan either left to right or right to left. You can even turn the page upside down! Should I press down hard in order to scan? No. Just swipe it lightly, beginning in white space and ending in white. Swipe kind of quickly…about as fast as you can say “swipe.” You will develop a rhythm after you do it a few times. Do I need to keep the roll sheets in any particular order? No. Just keep each class together. You do not need to keep them together by division. You can add guests for each class by clicking on the Add Guest button on the meeting page. This can be done after you complete the attendance for each class, or you can enter attendance for all classes and return to each meeting to add the new guests. If someone gets marked present for a meeting by mistake, regardless of how the attendance was initially recorded, you can very easily make a correction. Go to the person’s record Involvement > Attendance tab and remove the check mark beside the meeting for which they were incorrectly marked present. It does not matter if the person was recorded as a member or a guest. You just remove the check mark and the attendance is removed. You can also make the correction by going to the organization Meeting tab and clicking on the correct meeting . Then select the Edit radio button and remove the check mark beside the person’s name. 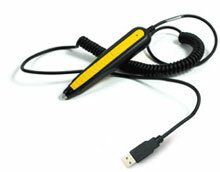 If you choose to scan the roll sheets for attendance, you will need to purchase a USB pen scanner like the one below. (Be sure it has a USB connection). These can be plugged in to any computer and can be shared among several staff members. In other words, not everyone who records attendance will need their own scanner; the scanners can be passed around. They are basically plug and play - nothing to install.